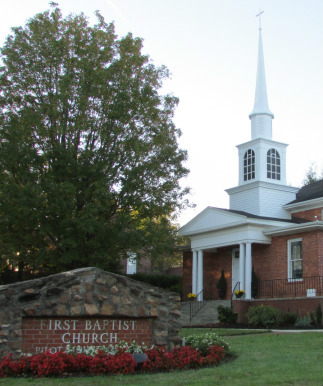 The community of First Baptist Church welcomes you to come as you are and join any of the church's Sunday or Wednesday services. Please bring your friends or family and try an activity or two! During worship hours, guests may park along the street in front of the church and enter through the fellowship hall. *During church services, lower rear entrances are locked for security purposes. Please enter through the front entrance. Additional parking spaces are located in the rear of the church, and may be used during during non-worship activities and special events. Our church is accessible to individuals with disabilities, and features wheelchair ramps, automated doors, and an elevator to assist visitors. Accessible parking spaces are located in the rear parking lot.